Happy Makar Sankranti Wishes To Everyone! May the Sun Radiate Peace, Prosperity & Happiness in Your Life On this special Occasion and Always!! 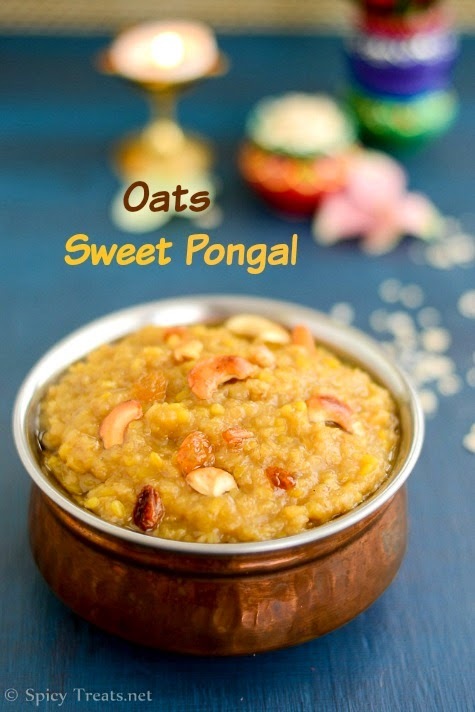 I am sharing a healthy sweet on this special day, Oats Sweet Pongal / Oats Sakkarai Pongal. Last year I shared Thinai Sakkarai Pongal / Millet Sweet Pongal and this year sweet Pongal using Oats. 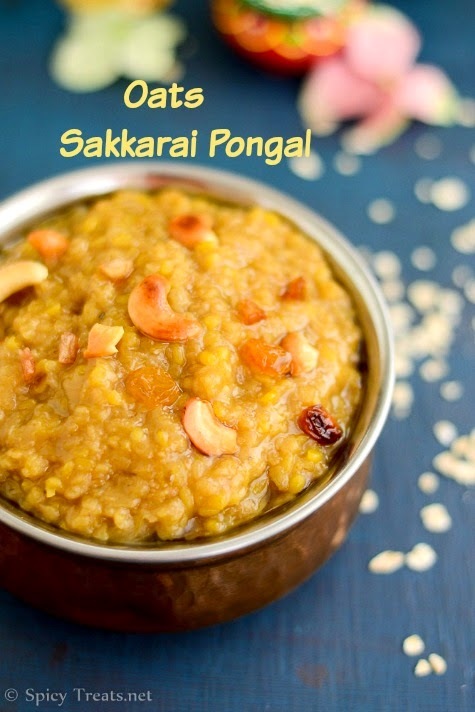 Oats Sweet Pongal is quicker and easier than the regular Sakkarai Pongal using Rice. I followed the Basic Sakkarai Pongal recipe and cooked it on stove top without pressure cooker method. Jaggery Paired well with Oats and the pongal turned out finger licking good. 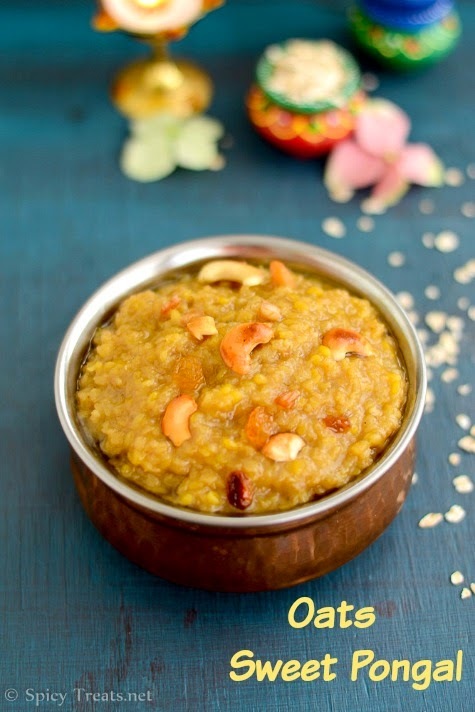 For all Oats Recipes lover this sweet pongal is a must try. I thoroughly enjoyed this delicious Pongal and even My kids loved it a lot. Cashew nut 6 or 7 no. Raisins 3 or 4 no. Powder the jaggery and dissolve it in less than 1/4 cup of water, then filter it and pour it to the sauce pan and bring it to boil. Boil the kaggery syrup until it turns slightly thick and one string consistency and switch off the stove and keep aside. in medium heat till it is tender and cooked but not mushy. Mean while, heat 1 tsp ghee in a pan, add cashew nut, coconut pieces and fry till golden brown and transfer to a small plate. To the same pan add raisins and fry golden brown and remove from the pan. And to the same pan, add few drops of ghee and roast oats for a minute and switch off the stove. When the moongdal is cooked, add oats and cook until it gets cooked and reaches a oatmeal consistency. If you feel it too liquidy then stir in medium high heat for another minute, or If it is dry add couple of tbsp of milk and cook well. 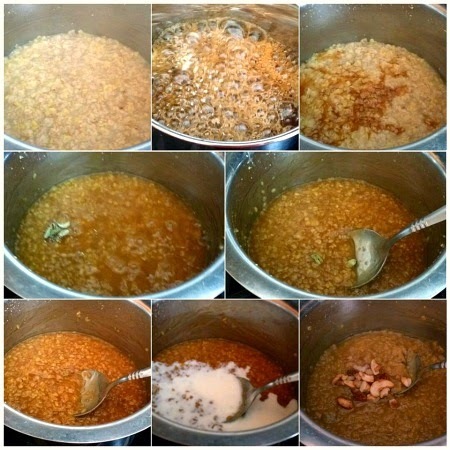 To the cooked oatmeal add jaggery syrup and cook in medium heat for 3 minutes. Then to it add cardamom powder and stir well. And then add milk(at room temperature) and simmer for a minute and switch off the stove. Finally add remaining 2 tsp ghee and roasted nuts, raisins & coconut pieces. That's it...Delicious Oats Sweet Pongal Ready. Serve Warm with ghee drizzled on top. Adding Moongdal gives nice nutty flavor, taste and richness to the pongal but you can also make it as a plain pongal without moongdal. Addition of salt is optional but it helps for the perfect sweetness for any sweet dish. I added a tiny pinch of turmeric powder for nice golden brown. Though I used Paagu Vellam the moong dal looked pale so I added turmeric powder. Coconut pieces gives nice crunch and taste to Sweet Pongal. 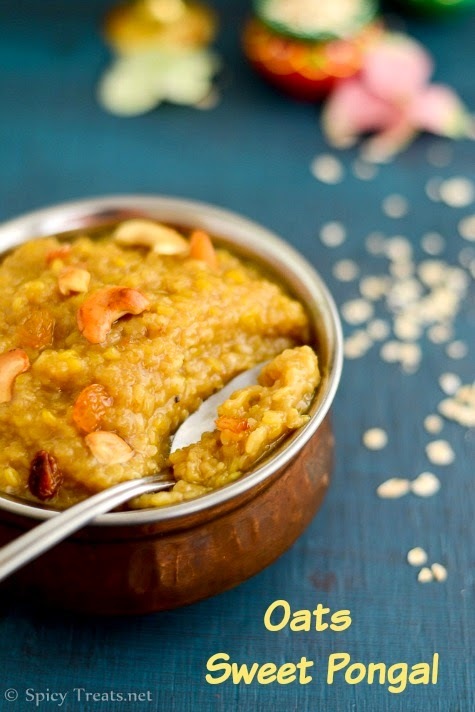 Serve Oats Sweet Pongal Warm but even after cooling it tasted good. You can also use Old Fashioned Oats or any kind of oats but add water accordingly. Sakkarai Pongal With Jaggery Syrup gives nice taste, thickness and nice texture to Pongal. Milk is also optional but I like milk in my sweet pongal, so i added. 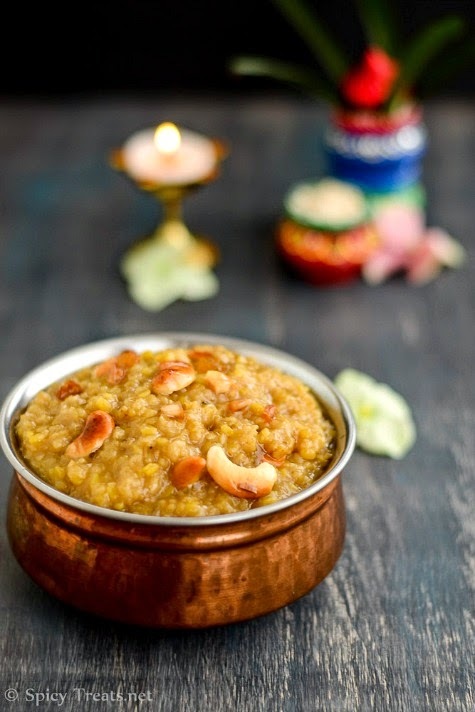 Happy New Year and Happy Pongal to you Sangee, oats pongal looks so divine, beautiful clicks dear..
lovely sweet treat for a festive day. very tasty and tempting .. I tried before Oats and jaggery good combo! I wanted to try it but ran out of dal will try soon!lovely clicks. A nice twist to traditional pongal...Lovely pics!!! I am following the links recently...getting so many yummy yummy ideas from ur links.